Aren’t you tired of having your team separated during events in Cannes? 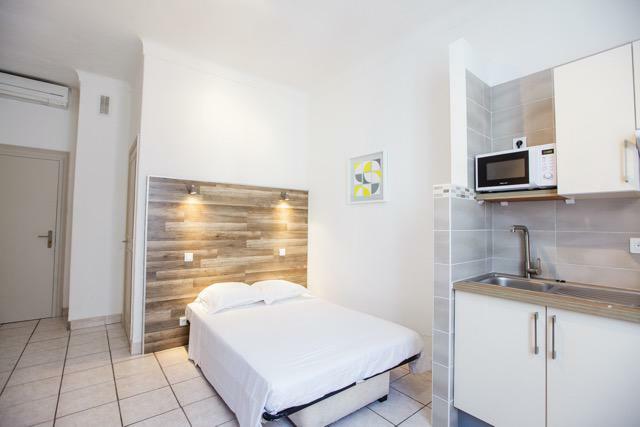 This year stay in this central Cannes apartment complex and keep your whole team under one roof. 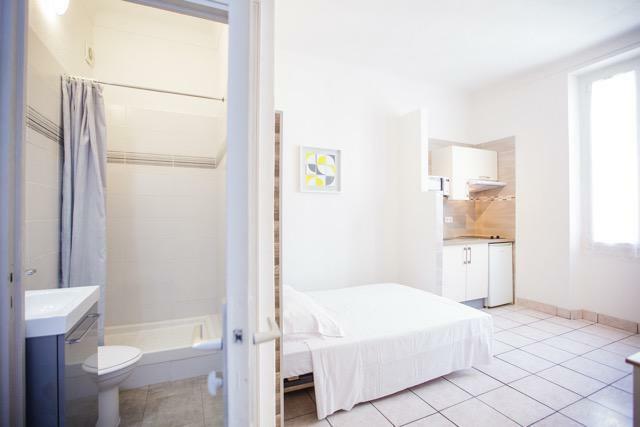 This apartment is one of the 12 basic and economic Cannes studio apartments available to rent for group accommodation in the same building. Located at a 4-minute walk from the Palais des Festival and the beach, this one-of-a-kind Cannes property offers the perfect accommodation for groups and teams travelling on a business trip to Cannes. All the apartments are similar to each other and can be rented together or separately. 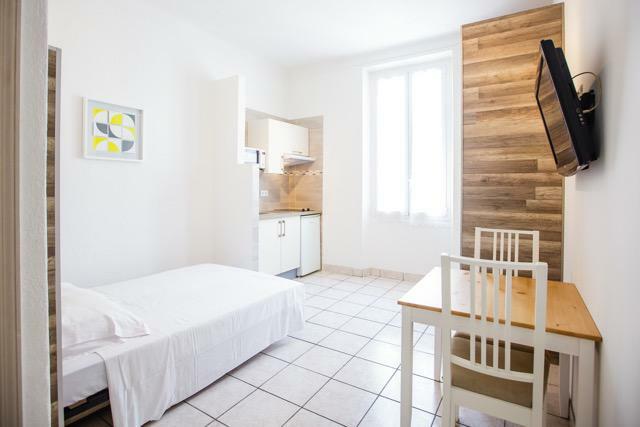 This particular smart studio apartment features white painted interiors along with fine wooden finishing. 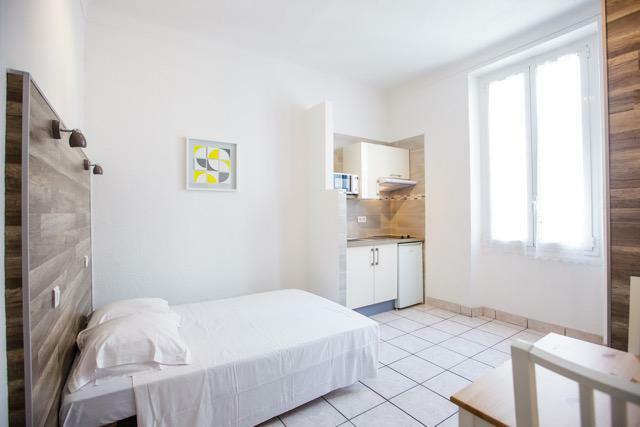 The apartment is provided with a double bed, a table with 2 chairs and a tv in the living space. The bed is placed facing the window that allows plenty of sunlight in the apartment. 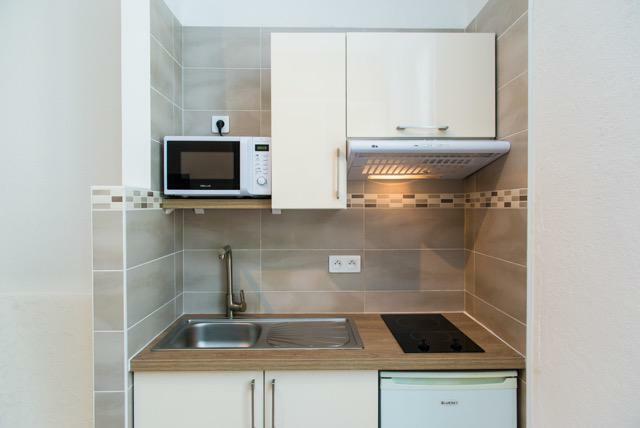 The open kitchen is equipped with a mini-fridge, a microwave and an induction cooktop. 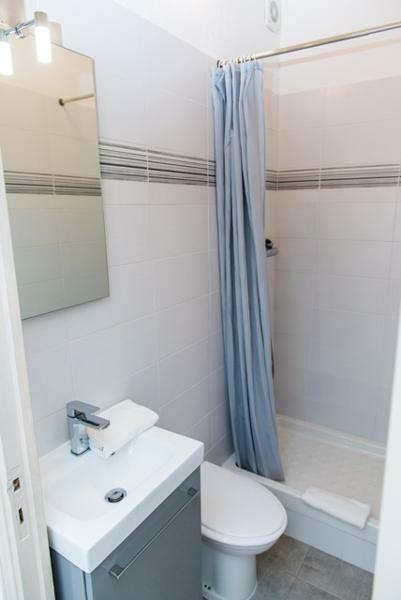 The bathroom consists of a standing shower and toilet separated by a curtain. Some of these studios are a bit more spacious than the others and come with sofa beds along with double beds if one requires to accommodate a few extra guests. This Cannes corporate accommodation is perfectly suitable for teams who are travelling to Cannes to attend conferences or events in the convention centre. Here, you have a unique travel option of enjoying the stay with your group and having your own privacy at the same time.